Authement's legacy is impressive considering he is credited as being one of the co-founders of CODOFIL. Authement was promoting French in the eastern part of the state while Jimmy Domengeaux, a former state Legislator and U.S. Congressman, was pushing for French education classes in the public schools in the southwestern part of Louisiana. It was Domengeaux's thinking that if they combined resources and worked together in unison they could create a number of local CODOFIL chapters throughout the state to help combat the decline of the spoken French language in Louisiana. It was a stroke of genius. CODOFIL was created in 1968 by the state Legislature, with Domengeaux being listed as President and Paul Tate and Elmo Authement as co-vice Presidents. The act was one of the most creative and innovative laws to ever come out of Baton Rouge. Immediately, it impacted over a half-million French-speaking Louisianians and, according to the current president of CODOFIL, Warren Perrin, has made Louisiana a national leader in the education of foreign languages. For years, Authement has been a fixture on cable TV as the host of the very popular AOC call-in program, "L'Academié Cadienne." Each Monday night on Cable Channel 5, viewers tune in to Elmo and co-host, Mike Landry, who conduct the live program in French, answering questions about such subjects as the origins and pronunciation of French words. Unfortunately for Louisiana, the program airs only in Lafayette Parish at this time. As president of "Television Louisiane", Authement helped secure the exclusive rights for the broadcast of French programming on TV5 via satellite. Only in Lafayette Parish can one tune in on Channel 66 to enjoy exclusive European-produced French programs that are of exceptional educational value to the community and the schools. Authement was born April 15, 1921 in Cut Off, Louisiana. As a boy, he worked on his father's farm growing and selling Irish potatoes for 50 cents a sack. In an average year, they sold over 2,500 sacks of potatoes. He graduated from Cut Off High School in 1937 and attended USL, graduating in 1941. 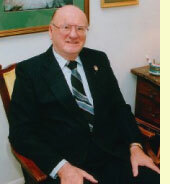 He earned a Master's Degree from LSU in Business Administration in 1949. He served his country in World War II in the Army Air Corps, and, during the Korean War, he served in the U.S. Navy. He is a member of the retired reserve with permanent commission of Captain. The countries of France and Canada, along with CODOFIL, have long recognized Authement for his devotion to the defense of the French language in Louisiana and have honored him accordingly. He is the recipient of the "French Academic Palms" and the "Canadian Order of the American Francophone." Authement is married to the former Jeanne Larriviere and has two daughters.